March 18, 2016 – NASA astronaut Jeff Williams is now the first American to become a three-time, long-term resident of the International Space Station. He arrived at the orbiting laboratory at 11:09 p.m. EDT Friday, with cosmonauts Alexey Ovchinin and Oleg Skripochka of the Russian space agency Roscosmos, where they will continue important research that advances NASA’s Journey to Mars. The trio launched aboard a Soyuz TMA-20M spacecraft from the Baikonur Cosmodrome in Kazakhstan at 5:26 p.m. (3:26 a.m. Saturday, March 19, Baikonur time), orbited Earth four times, and docked at the station. The hatches between the spacecraft and station opened at 12:55 a.m. Saturday, March 19. The arrival of Williams, Ovchinin and Skripochka returns the station’s crew complement to six. 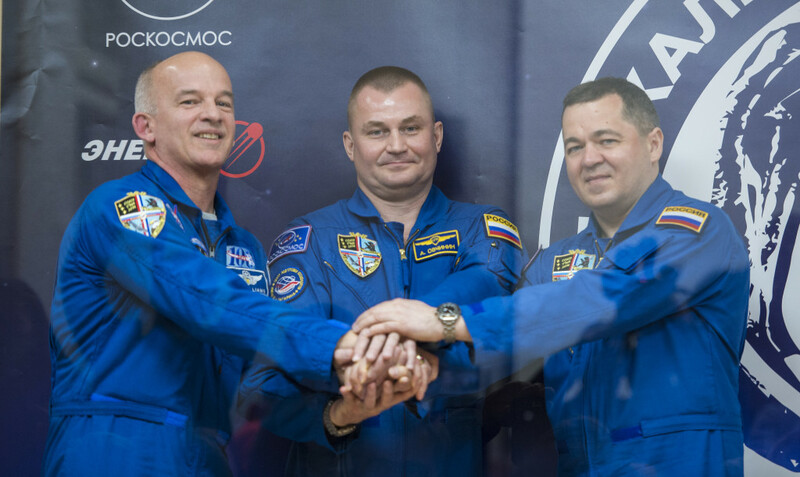 The three join Expedition 47 Commander Tim Kopra of NASA and Flight Engineers Tim Peake of ESA (European Space Agency) and Yuri Malenchenko of Roscosmos. The Expedition 47 crew members will spend five months conducting more than 250 science investigation in fields that benefit all of humanity, such as biology, Earth science, human research, physical sciences and technology development. Investigations arriving on Orbital ATK’s fifth NASA-contracted commercial resupply mission in late March will include a study of realistic fire scenarios on a spacecraft, enable the first space-based observations of meteors entering Earth’s atmosphere from space, explore how regolith, or soil, behaves and moves in microgravity, test a gecko-inspired adhesive gripping device that can stick on command in the harsh environment of space, and add a new 3-D printer for use on station. Expedition 47 crew members also are expected to receive the first expandable habitat, which will allow NASA its first test of an innovative habitat concept that can support astronauts who live and work in the harsh environment of space. The Bigelow Expandable Activity Module (BEAM) is an experimental expandable module scheduled for delivery on SpaceX’s eighth NASA-contracted cargo resupply mission this spring. Although astronauts will not live in BEAM, it will be attached to the space station, expanded and tested for a minimum two-year demonstration, and crew members will enter periodically to evaluate performance of the habitat. NASA is considering the use of expandable habitats to support crew members traveling to an asteroid, Mars and other destinations. An expandable habitat such as BEAM takes up less room on a rocket, while allowing additional volume for living and working in space. The crew members also are scheduled to receive one Russian Progress resupply mission delivering about three tons of food, fuel, supplies and research. During his six-month mission, Williams will become the American record holder for cumulative days in space — 534 — surpassing Expedition 46 Commander Scott Kelly, who wrapped up his one-year mission March 1. Williams will take command of the station on June 4 for Expedition 48. Williams, Ovchinin and Skripochka will remain aboard the station until early September 2016. Kopra, Peake and Malenchenko will return to Earth on June 5. For 15 years, humans have been living continuously aboard the International Space Station to advance scientific knowledge and demonstrate new technologies, making research breakthroughs not possible on Earth and that will enable long-duration human and robotic exploration into deep space. A truly global endeavor, more than 200 people from 15 countries have visited the unique microgravity laboratory that has hosted more than 1,700 research investigations from researchers in more than 83 countries.